Candace Nicole Parker is an American basketball player for the WNBA's Los Angeles Sparks and UMMC Ekaterinburg of Russia. She is the younger sister of retired NBA player Anthony Parker. She attended the University of Tennessee and was drafted by the Sparks in 2008. She may be best known for being the first woman to dunk in an NCAA tournament game and the first woman to dunk twice in a college game—she set both milestones as a redshirt freshman on March 19, 2006. She also became only the second player to dunk in a WNBA game on June 22, 2008. Parker won the 2009 Nickelodeon Kids' Choice award as the favorite female athlete in the sports category, and was a guest star on Figure It Out. Candace Parker was born on April 19, 1986 to Natasha, who currently works for the front office of the Chicago Sky, and Larry, who is in the insurance business. She has two older brothers: Anthony Parker, who was an NBA player, and Marcus, who is a doctor. She grew up in Naperville, Illinois. Her whole family loved basketball, and she began playing at an early age. Her father had played at the University of Iowa in the 1970s. The family were also huge Chicago Bulls fans. Candace was 2nd guessing about playing basketball, fearing she would not live up to the level of play her father and brother demonstrated, so she focused on playing soccer. It wasn't until the eighth grade that her family convinced her to play. Her father would help coach and critique her. Candace said of the experience, "He did things to make me mad, to challenge me, because I was so much more athletic and had so much more knowledge of the game than everyone else that sometimes I just coasted. If me and my dad went to a park and he didn't think I was practicing hard enough, he'd just get in the car and leave. And I'd have to run home. I mean run home. Once I figured that out, I'd always try to go to close-by-parks." Like her older brother Anthony Parker, she attended Naperville Central High School in Naperville, Illinois;. "The first two times I tried it in games I failed. Embarrassing! The third time was a charm and then cameras and reporters were everywhere—everyone wanted to talk about dunking." While in high school, Parker led her basketball team to Class AA state titles in 2003 and 2004. She amassed numerous accolades. She is the only two-time award winner of the USA Today Player of the Year, winning the award in 2003 and 2004. Parker also won the Naismith and Gatorade Awards as national basketball player of the year for each of those years. She joins Marion Jones, Greg Oden, Brandon Knight and LeBron James as the only back to back winners of the Gatorade honor. Parker was named WBCA All-American. She participated in the 2004 WBCA High School All-America Game where she scored nine points. In March 2004, she won the slam dunk contest at McDonald's All-American Game, despite her male counterparts executing dunks with a much higher degree of difficulty. She also got on the USA Today All-USA high school basketball team and won the USA Today Player of the Year Award. She was a consensus pick as player of the year in Illinois in 2002, 2003, and 2004. A four-year member of the All-State first team, Parker compiled a school-record 2,768 points (22.9 points per game) and 1,592 rebounds (13.2 rebounds per game) while starting 119 of the 121 games in which she played. She also became the first women's player to announce her commitment live on ESPNEWS. The summer after her junior year in high school, Parker tore her ACL in her left knee in a summer league game. She returned in December of her senior year and went on to lead her school to its second consecutive state title. 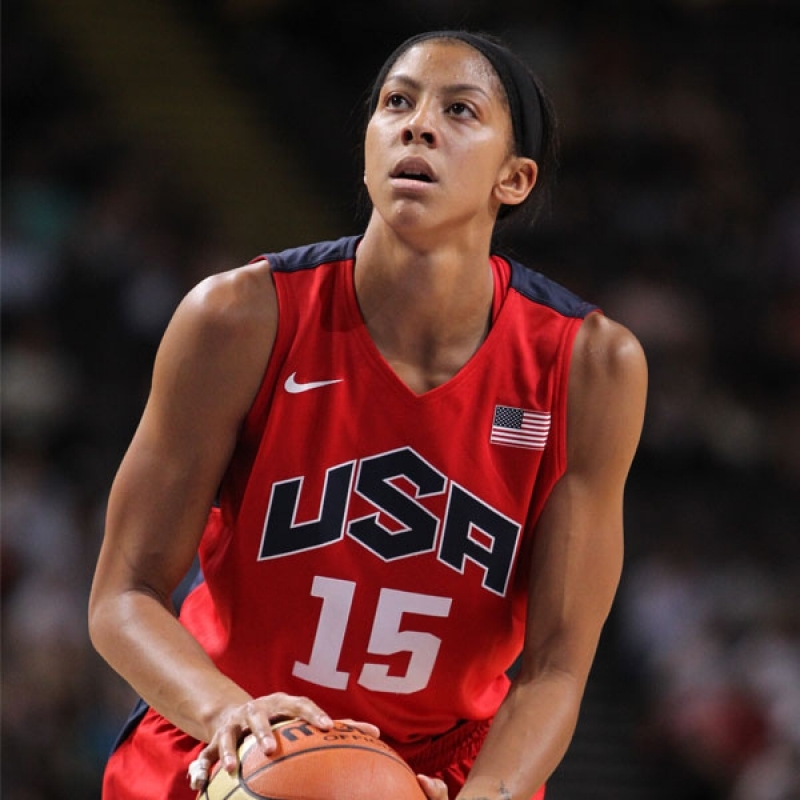 In August 2004, the "CP-3"s, Team USA roommates Candace Parker and Courtney Paris, led the undefeated USA Junior World Championship team to a Gold medal with 16.6 ppg, 8.8 rpg, 15.8 ppg, & 9.0 rpg respectively. While training, Parker had a relapse of knee pain and was required to undergo surgery in her lateral meniscus & the lateral articular cartilage in her left knee. Late in her high school career, Parker was featured in an episode of the television show Switched. She traded places, for a short time with an East Coast surfer of the same age. Parker attended the University of Tennessee. She took a medical redshirt her freshman year of college, and started for the Tennessee Lady Vols during the 2005-06 season. She would make history yet again as she would dunk twice in one game. Carol Ross, head coach of the University of Mississippi Ole Miss Rebels, said this of Parker: "She's the toughest matchup in the game. On many nights, she's the best guard on the floor, the best post on the floor, the best rebounder on the floor, the best passer on the floor, and, let's not forget, the best scorer on the floor. She's got the strut of a competitor and the stuff of a champion." She was the Southeastern Conference Rookie of the Year (Coaches and AP) and helped the Lady Vols win the 2006 SEC Tournament Championship. With 17 seconds remaining in the 2006 SEC Tournament Championship Game against LSU, Parker hit the game-winning shot. She was named Tournament MVP and was named to the 2006 Kodak All-America team, making her one of the few to ever receive the award as a freshman. However, in the NCAA Tournament regional finals against North Carolina, Parker got in early foul trouble and was out of the game for much of the first half. The University of North Carolina ultimately won the game. On January 28, 2007, in an away game against Alabama, Parker scored her 1,000th career point as a sophomore making her the fastest player in Lady Vol history to do so. She did it in 56 games, besting Chamique Holdsclaw's mark of 57 games and Tamika Catchings's of 58 games. On March 1, at the SEC tournament in Duluth, Georgia, Parker was named the 2007 SEC Player of the Year. On April 3, she led the Lady Vols to their first National Championship victory since 1998, beating Rutgers 59-46; Parker finished the game with 17 points and earned the tournament's Most Outstanding Player honor. Parker announced on February 21, 2008 that she would forego her final season of eligibility at Tennessee in order to focus on the 2008 Olympics and pursue a professional career. She graduated with her incoming class in May 2008. A sports management major who had a 3.35 grade point average as of December 2007, she was named University Division Academic All-American of the Year in women's basketball for 2008 by the College Sports Information Directors of America. On April 8, 2008, Parker led the Lady Vols to their second straight NCAA women's title, the eighth championship for Tennessee. She was also named the MVP for the second consecutive tournament, joining Cheryl Miller, Chamique Holdsclaw and Diana Taurasi as the only female players to have done so. She won the honor despite suffering a dislocated shoulder during her team's regional finals win, but returned (wearing a white long-sleeve T-shirt under her jersey) and led the Lady Vols to the title. Although Parker had a year of eligibility remaining due to her medical redshirt in the 2004-2005 season, she opted to enter the WNBA Draft following the championship victory. While at Tennessee, she compiled a record of 101 wins and 10 losses. Just after the NCAA victory, Parker was selected as the first pick in the 2008 WNBA Draft by the Los Angeles Sparks. She currently plays alongside Olympic teammates Tina Thompson and Delisha Milton-Jones. Shannon Bobbitt (Parker's teammate at Tennessee) joined the Sparks after being drafted in the second round. On May 17, 2008, in her debut game against the Phoenix Mercury, she recorded 34 points, 12 rebounds and 8 assists. Her 34 points broke the record for a rookie in a debut game. The record was previously held by Cynthia Cooper, who scored 26 points in her debut game in 1997. On June 22, 2008, she became the second woman in WNBA history—after her teammate Lisa Leslie—to dunk during a regulation WNBA game against the Indiana Fever and Michelle Snow in the 2006 WNBA All-Star game. The dunk was on the same basket as the dunk of her teammate. Parker was named the Hanns-G 'Go Beyond' Rookie of the Month for the month of May 2008. She received the same honor for July 2008. In August 2008, the WNBA suspended play for a couple of weeks to some of their players to join the U.S.'s National Women's Basketball at the 2008 Summer Olympics. Parker was selected to go, as was teammate Lisa Leslie, and the US team cruised with 8 straight victories to achieve the gold medal. They won games with an average margin of 38.8 points. They faced Australia in the final game, and won, 92-65. Parker averaged 9.4 points in the tournament, and scored 14 in the finals game. On October 3, 2008, she was named the Hanns-G 'Go Beyond' Rookie of the Year as well as Most Valuable Player for the 2008 WNBA season. She became the first WNBA player to win both the Rookie of the Year and the Most Valuable Player in the same season. In addition, she also joined Wilt Chamberlain and Wes Unseld as the only professional American basketball players to win both ROY and MVP trophies in the same season. 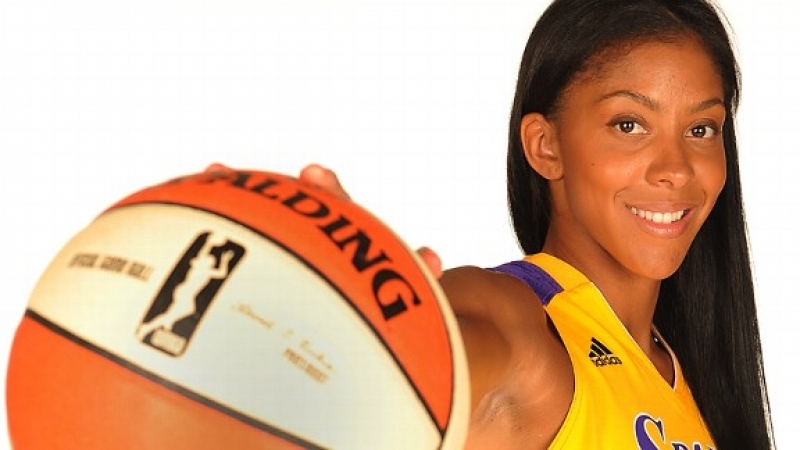 Candace Parker missed the first eight games of the 2009 WNBA season after giving birth to daughter, Lailaa Williams. On June 30, Candace returned to practice with her teammates for the first time. She played her first game back from maternity leave on July 5, 2009. Candace earned 2nd Team All-WNBA honors despite missing almost a full month. She led the Sparks to the Western Conference Finals but lost in 3 games to the Phoenix Mercury. In the playoffs, Parker averaged 18 points and over 10 rebounds per game. She missed most of the 2010 WNBA season due to a shoulder injury. In 2011, Candace Parker played six games. During the seventh game, with 5:56 left in the third quarter, Parker went down after grabbing a defensive rebound and making brief contact with Quanitra Hollingsworth. After getting an MRI on June 27, she found out she had a torn meniscus in her right knee, causing her to miss the remainder of the season. In 2012, Parker played the full season and helped her team to a 24-10 record, making the playoffs as the second seed in the west. In the first round, they beat the San Antonio Silver Stars two games to none. In the western conference finals, against the Minnesota Lynx, the Sparks lost two games to none, while Parker scored 33 points, grabbed 15 rebounds, and had 4 blocks in a must-win game two, which they lost, 80-79, therefore ending their season. Parker was very emotional following the loss, hugging her mother Sara. On July 27, 2013, in her sixth season, Candace played in her first all-star game. She scored 23 points and grabbed 11 rebounds in a come from behind win for the West and was named MVP. This season, the Sparks finished with the same record as a year earlier, again earning the second seed in the Western Conference. They faced the Phoenix Mercury in the Western Conference Semifinals. In Game 1, at Staples Center, the Sparks lost, forcing them to win in game two, at Phoenix to stay in the series. In Game Two, Parker scored 31 points to lead the Sparks to a win, bringing the series back to LA for a game three. In a nailbiter, the Sparks lost on a last second jumper by Phoenix rookie Brittney Griner, ending the Sparks' season by one point for the second straight year. Parker was invited to the USA Basketball Women's National Team training camp in the fall of 2009. The team selected to play for the 2010 FIBA World Championship and the 2012 Olympics is usually chosen from these participants. At the conclusion of the training camp, the team will travel to Ekaterinburg, Russia, where they compete in the 2009 UMMC Ekaterinburg International Invitational. Parker was one of 21 finalists for the U.S. Women’s Olympic Basketball Team Roster. The 20 professional women's basketball players, plus one collegiate player (Brittney Griner), were selected by the USA Basketball Women’s National Team Player Selection Committee to compete for the final roster which will represent the USA at the 2012 Olympics in London.